4,000 partners are new to WPC. Driving $609 billion (or was it in IT revenues worldwide — meaning that partners drive about $10 in services revenues for every $1 of Microsoft software they recommend and/or sell. This year Microsoft’s partners will be acknowledged as ‘the leaders’ in delivering cloud software. Looks like we’re in for a fireside chat. Will Karlgaard ask the tough questions? Ballmer says 1,000 new partners are jumping into the Microsoft cloud every month. Ranking 2012 vs. PC launch year and Windows 95 year. 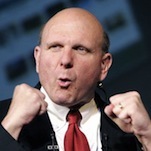 “This is an epic year,” said Ballmer. “The PC mainstreamed technology in 1981. Windows 95 made computers open and accessible to everyone. Windows 8 will kick off the most epic year in Microsoft’s history. Skype has 250 million users. New OEM devices will showcase Windows 8 devices, and Microsoft Surface “of course” will be a leading offering in the tablet market. Office 365 channel partners are now permitted to manage cloud billing to end-customers, a big move that some partners have demanded for a year. More than 50 percent of corporate desktops now run Windows 7. More than 500,000 desktops move to Windows 7 per day. Partners have sold more than 630 million Windows 7 licenses to date (The VAR Guy needs to double-check those stats). Windows 8 will release to manufacturing in August, with first Windows 8 PC shipments and upgrades available in October 2012. Microsoft demonstrated multiple Windows 8 PCs, ultrabooks and tablets. The Lenovo Yoga (checking name) earned some “oohs” and “ahhs” from the audience. When Windows 8 launches, a commerce store will be available with all the apps users need — games, productivity apps and more. Microsoft has acquired Perceptive Pixel, a multi-touch and user interface company. The VAR Guy is gathering more details. The VAR Guy is now heading to meetings with Samsung, Sony… and several other surprise gatherings. Stay tuned. When Ballmer predicts the future, shareholders starts shivering down their spine. Ballmer has a pretty devastating record wrt predictions. Meanwhile reports indicates that the usage of the W8 betas is only 1/3 of what it was with W7 at same stage. I’m having a hard time picturing good reasons for upgrading W7 to W8 – and if 50% of corporate is already into W7 – W8 will be fighting for the remaining less than 50%. Further, if corporate is already enrolled with W7 they will continue to expand that rather than adding W8 for replacement machines or expanding workforce. The key will still be the tablets – question is if MS lost consumer confidence as WP7 users are left to dry wrt WP8.